Today, on behalf of the entire (two-person) staff here at Team K&R1, I'm tremendously excited to announce that, thanks to an enormous amount of help and not a little patience from roboticist-in-residence Monica and her assistants, our latest project is shipping. And by "shipping", I mean literally being sent through the mail. I have to say, there's a certain finality in hearing 80 stamped, addressed save-the-date postcards thud into the bottom of a mail collection box. No backing out now! That is ... freaking brilliant. 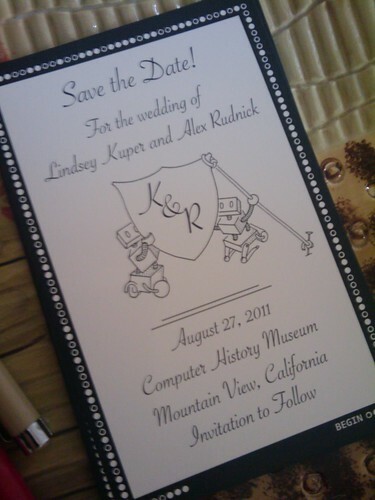 If this is what the save the date looks like, I MUST see a picture of the invitation! I guess we should probably get some of those made or something, huh? Y'all are two of the nerdiest nerds who ever nerded. OH NO FORGET I SAID ANYTHING. Wow! At the computer history museum, no less! Excellent. I guess you'll just have to settle for the reality of being good at a different kind of completely gorgeous drawing. Is there a secret coded around the edge? Adorable! The Date has been saved!!! Computer History Museum- HO! Monica's helper robots + K&R = warm fuzzy feelings!